Lock in a great price for Andorra Park Hotel – rated 9.1 by recent guests! Beautiful, spacious and comfortable Jr. Suite. Great value. Garden and pool quiet haven but very close to busy shopping areas. Extra friendly staff. Good and clean facilities. Nice and quiet location. The breakfast was SUPER. The SPA was included in our reservation by default. Quite location with a nice view, a walking distance through the hotel garden to the multi-story prking elevator and you’ll be in the middle of a main active street leading old village and new area’s too full of shops, restaurants and many many duty-free shops. This is a beautiful property. Lovely balcony and gardens. The room was quite comfortable. Staff was friendly. Rooms are spacious and clean. The views of the mountains are beautiful and you'll love the rain shower feature in the bathroom. The buffet breakfast was wonderful. Great selections of a variety of meats, eggs, fruit,all sorts of beverages. The staff was friendly and helpful. Andorra Park Hotel This rating is a reflection of how the property compares to the industry standard when it comes to price, facilities and services available. It's based on a self-evaluation by the property. Use this rating to help choose your stay! One of our top picks in Andorra la Vella.Located in the center of Andorra La Vella, the Andorra Park Hotel offers beautiful views of the surrounding mountains and valley. It features a seasonal outdoor swimming pool and fitness center. Free WiFi is offered throughout the property. 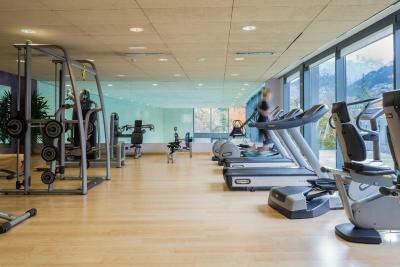 The Andorra Park's fitness center facilities include a sauna, gym and indoor swimming pool. The Pyrenees Shopping Center is less than 1,650 feet from the hotel and Sant Esteve Church is just 10 minutes’ walk away. The nearest ski resorts are around a 20-minute drive from the hotel. When would you like to stay at Andorra Park Hotel? Featuring a balcony, this spacious apartment is separated into 2 levels and includes a dining area with a TV, and a kitchenette fitted with microwave and fridge. The bathroom comes with free toiletries and hairdryer. House Rules Andorra Park Hotel takes special requests – add in the next step! Andorra Park Hotel accepts these cards and reserves the right to temporarily hold an amount prior to arrival. Please note that the outdoor swimming pool is open from 01 July until 31 August. The whole experience was absolutely exceptional from the start to finish! Staff were wonderful, facilities amazing and a superb location, quiet enough yet close to everything! This is absolutely a FIVE-STAR hotel! Just like its name: a garden hotel, as you could see a beautiful garden with swimming pool. Everything looks quite natural. Modern facility, automatic lightening and curtains in the quiet rooms, big saloon to watch football games, paintings and flowers in each corner. They pay attention to details! just flawless! A very unsatisfied experience we had with this five star hotel. We booked a duplex room with kitchen for 4 nights for our skiing trip. We came back late after skiing on the 1st night and found the air-conditioning in the room was fail, the upstairs was hot like a sauna, after the technician fixing it, which still not working, finally, we were changed to a family room and the staff quoted us a new price which is lower (around EUR300 different) it was a downgrade, no kitchen and not duplex. We agreed to take it after two hours and late night, repacking with the kids and all the hustle they gave us. However, the next day, we checked if we had the refund due to the downgrade, they said their manager refused to refund, since we booked via booking.com. first, they required us to pay in full when checked in, we never come across with it after staying with so many 5 five-star hotels, or they knew the room had faulty which needs to be changed? I don’t know if it is our fault to book thru booking.com or any other reasons. We reviewed and trusted booking.com for this hotel since this is our first visit to Andorra. However, the hotel manager was using booking.com as an excuse not to refund the downgrade. As a premium customer spending over EUR400/night, we are very disappointed with the hotel arrangement regarding their room faulty condition. The staff were really friendly and nothing was too much trouble. There was a free shuttle to the ski resort and the minibus was immaculately kept and the drivers really helpful. The rooms were amazing and the view from the junior suites was outstanding. I loved the pool and health suite. Will definitely return. Good location for the main shopping street just through the grounds and then down the lift in shopping centre car park. Very good breakfast.